With the last economic recession, school districts across the nation and in California laid off large numbers of teachers. 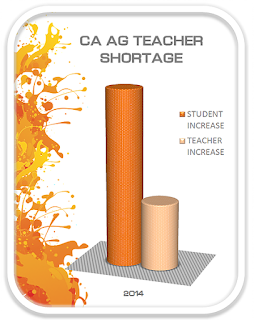 The recent uptake of the economy and increased tax dollars for education, districts are now experiencing a large shortage of teachers. We also know that the number of college students who have enrolled in education courses has dropped significantly. How can expanded learning programs (ELPs) contribute to solving this shortage? We believe ELPs are perfectly positioned to allow young workers and future teachers the opportunity to learn skills that are very important to classroom work. In part 2 of ELPs and the Classroom Teacher Shortage, we offer interview responses from young adults who have migrated from ELPs to the teaching profession (René Ly, Graduate Student in Education and Substitute Teacher) and Anna Zimmerman (Graduate Student in Education and Future 4th Grade Teacher). In Part 1, we offered interview responses from ELP leader (Alec Lee, Aim High) and a teacher training leader (Mike Snell, California Teaching Fellows Foundation). 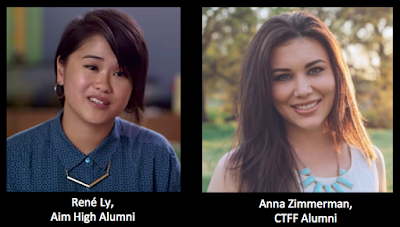 We also want to share this valuable and brief video that features René Ly and other young teachers who have migrated from youth work to teaching careers. Q: Can you say something about why you chose to become a classroom teacher? RL: I chose to be a classroom teacher because of the unique experience. 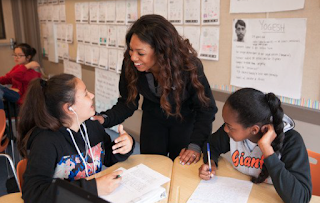 As a classroom teacher, I am able to be with my students and have the ability to be in community with them as well as witness their tremendous development throughout the school year. AZ: Becoming an educator has always been a passion of mine. When I was in high school, I joined an ROP class called Careers in Education, I knew that this is what I wanted to do. Being a classroom teacher is not only about loving children. It is about loving to see growth in the youth and loving to see the changes that these young lives are going through. Being an educator means you are a mentor and a role model for the youth. I chose to become a classroom teacher because I am passionate about making a difference in the lives around me. Q: Based on your experience, why are afterschool and summer youth programs well-positioned to serve as good training grounds for young people who want to be teachers? What do they offer that the traditional student-teacher experience doesn't? RL: Within the afterschool and summer program experiences, I was able to develop lesson plans based off of interests and hobbies all while aligned with the state standards. I remember conducting science experiments, teaching art and dance as well as reading units. Teaching in afterschool capacities allowed me to teach with less pressure in terms of institutionalized expectations. It allowed me to be creative and thoughtful throughout my planning. AZ: These programs allow you to experience what its like to be responsible for a group of students. You learn that not every day is going to go as planned and you learn to be flexible. One of the greatest lessons I learned in the after school program was to be resilient. It is so important to know that if a lesson is not as great as you wish it was, or if a student is struggling or being a distraction, it is important to implement classroom management skills that are well suited for the environment you are in. As an educator you must learn to be resilient and allow yourself to fail so that you can learn from that mistake. These programs for early teachers are great for supporting teachers in the making and giving them hands on experience with the kids. While sitting in a lecture class you can learn a lot of valuable information, however, you truly learn the most by working with the kids and learning that each kid learns and retains information differently. By working hands on in a classroom you are allowing yourself to experience an element of what its like to be a teacher. Q: Based on your experience, do you think afterschool and summer youth programs are well-positioned to encourage young people to consider the teaching profession as the next step in their career? Why? RL: I believe afterschool and summer youth programs are great stepping stones for young people to explore the route of teaching. Both programming provide opportunities to develop your craft, share it with students and most importantly practice. The leadership within the programs are also beneficial in terms of guidance and mentorship. AZ: These programs allow the future teachers to be in the classroom and working with the students in whole class discussions as well as small group. Also, these programs allow the future teacher to experience what its like to see a child's "lightbulb" go off when they grasp a concept. These are all important concepts for a teacher to see and experience. Not only is it beneficial to work hands on with the students, but these programs also offer a lot of guidance and structure when going through classes. The most encouraging and beneficial part for me, was that I was able to connect and build relationships with the staff and administration through different school sites. These people became friends, mentors, and also an amazing example of what teaching is all about. 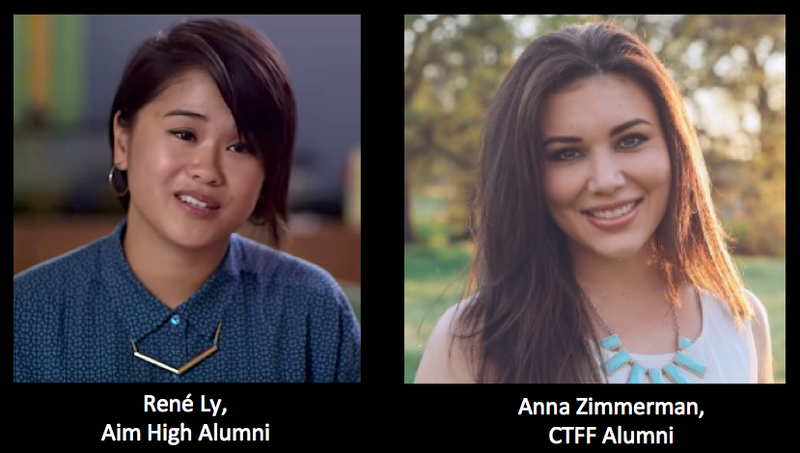 Q: In your own words, can you say something about the value of the Aim High and the Teaching Fellows program to your development as a young teacher? RL: Aim High's attention and care of their staff is the first and foremost of my development as a young teacher. I had the pleasure of working with veteran teachers who were open, kind, and willing to share their best practices. Aim High also gave me the opportunity to develop all aspects of my craft as a young teacher. From lesson planning to creating community, Aim High provides a space for that. My biggest take away from Aim High is that learning is FUN, CREATIVE, and MEANINGFUL. A recipe I will carry with me throughout my teaching career. AZ: California Teaching Fellows provided me with more than just a classroom setting to work in. This program allowed me to gain a better understanding of the education field and also a foundation for what to expect as a new teacher. Because of this program, I am confident in accepting a position as a 4th grade teacher. I feel confident in my ability to not only deliver meaningful lessons to my students, but also how to manage my classroom and how to build relationships with each of my students. This program has helped me make connections with valuable people in the field of teaching and it has taught me the professional side of being an educator. With the last economic recession, school districts across the nation and in California laid off large numbers of teachers. The recent uptick of the economy and increased tax dollars for education, districts are now experiencing a large shortage of teachers. We also know that the number of college students who have enrolled in education courses have dropped significantly. Serve as a training ground for students enrolled in education/teacher programs. Inspire youth workers who may be interested in advancing their careers by entering the teaching profession. How to build a caring community of youth. How to form meaningful relationships with youth. How to use project based learning to advance engagement and align these experiences with the interests of youth. How to advance social emotional learning and character skills through youth programming. 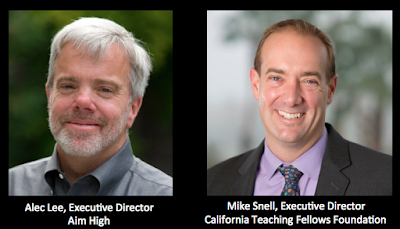 In Part 1, we offer interview responses from ELP leader (Alec Lee, Aim High) and a teacher training leader (Mike Snell, California Teaching Fellows Foundation). Also, Aim High was featured in Education Week for their success in encouraging youth workers to pursue a career in teaching. Click here to read the article. In Part 2, we will feature interview responses from teachers who began their careers as youth workers. Q: Can you say something about the recent teacher shortage in California and the Central Valley? What is this and what caused it? district leadership, it is a challenge to fill open teacher positions within the district. This is especially true in our more rural school districts. As increasing waves of baby boomers retire and interest in joining the teaching profession has been in steady decline, the demand and access to the quality gap is huge. As I connect with national after school providers across the country, they describe the challenges in their regions as being similar. Plain and simple, there are not enough young people choosing education as a career path, therefore credential programs are not able to produce the number of teachers required to meet the current demand. Recent studies suggest that the number of high school students interested in teaching as a career path has declined 55% in the last 10 years, from 9% of graduating seniors wanting to teach, to only 4%. I believe that those of us in the expanded learning space have a huge opportunity to influence young people’s perception of teaching as a career choice. Beyond opportunity, I believe we have a responsibility to all young people to place the best and brightest after school leaders in front of them, and my desired outcome is that this experience influences both the after school leaders as well as our young people, to promote teaching as a career choice. Q: How are afterschool and summer youth programs well-positioned to serve as good training grounds for young people who want to be teachers? MS: After school and summer present the best opportunities for those interested in education to gain tremendous real life experiences working with young people and working within the K-12 system. Year-round, after-school and summer staff earn hundreds, and in many cases, thousands of hours of classroom experience to build them up and prepare them for their career in education. Beyond experience at the point of service, our staff benefit from additional professional development and training around the systems and strategies that school districts deploy to accomplish their goals for all students. This is vital real world experience. They meet the school district support team, they collaborate with seasoned teachers, and often they interface with the superintendent. Developing these relationships while they are attending college and building their professional context for eduction provides a huge ‘foot in the door’ opportunity and will typically provide them advantages when competing for a teaching job against another candidate without after school or summer experience. They learn about the work, the culture, the preparation, the challenges, and they truthfully go into the profession incredibly well prepared. Here at Teaching Fellows we hear regularly from the over 40 superintendents we serve that are absolutely looking to our after school and summer staff as the best training ground and talent pool for future teachers in their respective districts. AL: Summer is a time to be different and step away from traditional classroom learning environments. At Aim High, our class size is 15-18 with two or three teachers in each classroom. Our curriculum is project-based and culturally relevant. We do two weeks of professional development before the kids come through the door. As a non-profit, we are freed from the constraints of public schools. We position ourselves at the intersection of rigor and fun. Young people are paired with lead teachers who have the opportunity to mentor. Summer can be a teaching laboratory. Lastly, many summer programs are community based and provide the opportunity to really know kids and their potential, issues and challenges very well. Q: How are afterschool and summer youth programs well-positioned to encourage young people to consider the teaching profession as the next step in their career? MS: The population of millennials, which is our current college-age population, will far outsize the baby boomer numbers. The generation that follows the millennials will be even larger. This population trend coupled with the national rise in after school programs and systems of support will be the key to attracting, train and retain generations of future teachers. With after school and summer staff leaders now in this space, we have the tremendous opportunity to leave a lasting impression and challenge students to follow in our footsteps, to choose a career that shapes careers. The Teaching Fellows are uniquely positioned to encourage young people a few different ways; Teaching Fellows match the demographics of the students they serve so there is a built-in level of trust. Furthermore, Teaching Fellows are college-attending role models for young people, students look up to Teaching Fellows and think ‘if they did this, then I can do this too’. That type of influence is powerful. These two factors uniquely position Teaching Fellows, and many other after school and summer staff to be in positions to encourage and inspire young people into the education profession, and to pursue their dreams. AL: Young youth workers in Aim High are given tremendous responsibility and opportunity. They also experience a culture of feedback and growth. Lastly, they work side by side with professional educators. Develop teachers and leaders who contribute to positive changes in the lives of students, their schools, and their communities. Produce diverse teaching professionals who implement innovative, effective teaching strategies. Fully engage the community in education and supporting future teachers and leaders. It is important that educators and youth development specialists understand the latest thinking on the needs of transgender youth. To support this, we worked with Diane Ehrensaft to develop a briefing paper entitled Understanding Gender Identity in Young People: A Briefing Paper for Afterschool Programs. We also interviewed Dr. Ehrensaft, which we posted on our LIAS blog in two parts (see Part 1 and Part 2). Dr. Ehrensaft, co-founder of UCSF’s Child and Adolescent Gender Center, coined the term “gender creative child” to describe children whose gender identity is not reflected in the male or female box that was checked on their birth certificates. Dr. Ehrensaft talked with Mina Kim on KQED’s Forum program about the experience of gender nonconformity and discussed her new book, “The Gender Creative Child: Pathways for Nurturing and Supporting Children Who Live Outside Gender Boxes.” We thought our readers would benefit by hearing Dr. Ehrensaft in her own words. This radio broadcast can be heard by clicking below. Diane Ehrensaft, Ph.D. is an associate professor of Pediatrics at the University of California San Francisco and a developmental and clinical psychologist in the San Francisco Bay Area, with a private practice in Oakland, California. She is Director of Mental Health of the Child and Adolescent Gender Center and chief psychologist at the Child and Adolescent Gender Center Clinic at UCSF Benioff Children’s Hospital. She specializes in research, clinical work, and consultation related to gender-nonconforming children, lecturing, publishing, and serving as an expert witness on both topics nationally and internationally. 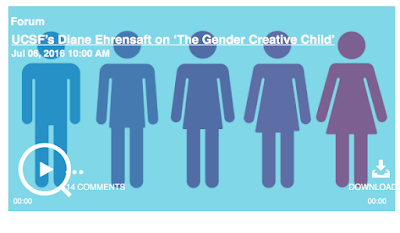 Dr. Ehrensaft is author of Gender Born, Gender Made; Mommies, Daddies, Donors, Surrogates; Building a Home Within (co-edited with Toni Heineman); Spoiling Childhood; Parenting Together; and the new release, The Gender Creative Child. Dr. Ehrensaft serves on the Board of Directors of Gender Spectrum, a national organization addressing the needs of gender-expansive children and their families.